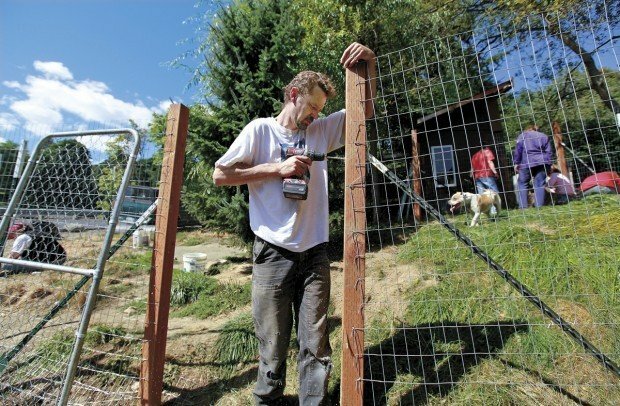 Leo Borton of Portland drills holes for the gate hinges as other Fences for Fido volunteers work on new dog houses and the rest of the fencing going up to give Lucy and Taz a safe place to run free at their home. Renee Canfield of Kelso comforts and calms Lucy, who was getting stressed with so many new people putting up fencing and new doghouses in what was usually her space. Month after month, no matter the weather, the 4-year-old pitbull was left outside chained to a tree in an overgrown yard near West Side Highway. The heavy choke-collar around Lucy's thick neck was padlocked to her chain. No new smells, no new scenery. Sometimes her chain tangled, and the friendly tan-and-white dog couldn't reach her ramshackle little shelter, leaving her exposed to the rain and the cold. "We'd always slow way down so we could see what she was doing," said Lexington resident Erin Fields, 31, who began tossing Lucy rawhide bones last December. Fields' heart ached for the lonely dog. She called the Humane Society but was told as long as Lucy had food, water and shelter, they couldn't intervene. As it turns out, someone else could. In May, Fields learned about Fences for Fido. Formed a little more than a year ago, the nonprofit Portland volunteer group is dedicated to improving the lives of outdoor dogs by removing chains, building fences, providing new dog houses and offering medical attention and free spaying/neutering. A week after Fields called Fences for Fido, its client outreach coordinator, Meg Willison of Portland, visited Lucy's house in outlying Kelso. At the house, Willison was surprised to find another dog chained up — a 14-year-old shepherd mix named Taz who couldn't be seen from the road due to the heavy brush and vehicles in the yard. His chain was so tangled she could only see his head sticking out of the bushes in a ditch. Willison, 47, asked the property owner if Fences for Fido could build the dogs a fence so they could live unchained, and he agreed. "I think he's amazed that people are doing this out of the good of their heart," said Willison, who declined to name the man. "I think most of the time, people are surprised. They're wondering what the catch is. They can't believe someone just knocked on their door and said, ‘We're going to give you a free fence.' "
Saturday, 15 volunteers — mostly local folks — cheerfully stretched a 6-foot-high welded wire fence around cedar fence posts sunk in cement four days earlier. They reinforced the bottom so the dogs couldn't dig out. The group also erected a temporary fence down the middle of the gated enclosure to keep Lucy and Taz separate for a few weeks until they get to know each other. "They'll probably be fine because they're both very, very sweet dogs, but just to be on the safe side ... " said Willison, who owns a plumbing company with her husband and volunteers in her free time. The project was also a milestone for these volunteers. 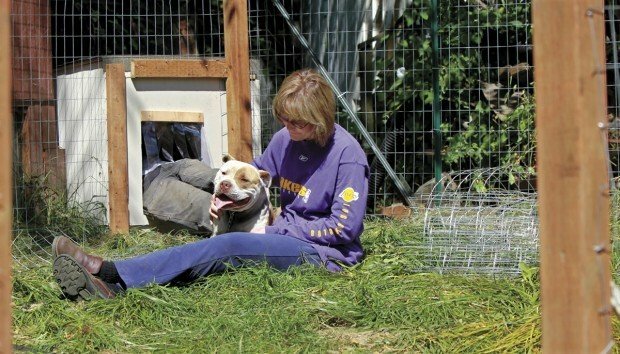 Lucy and Taz were the 99th and 100th dogs unchained in Portland, Southwest Washington and the Willamette Valley since Fences for Fido's first started in May 2009 — building a fence for a dog named Chopper. The group, which has more than 500 volunteers and no paid staff, has been building at least six fences a month but has 20 dogs on its waiting list. The cost for each project is $800 to $1,000, which includes the fence, shelter and spay/neuter, Willison said. If dogs need training or behavioral help, Fences for Fido can provide that, too. "It's fun because you're all working for the common goal," Willison said. "You all are dog lovers, you all want to relieve the isolation or get the dog off the chain. ... It's instant gratification for a lot of people ... they come to work hard and see the results." In Lucy's yard Saturday, workers assembled two dog houses built by a man in Beaverton who holds work parties every couple of months to crank out 20 shelters at a time. The tightly built boxes with shingled roofs have insulated floors, plastic flaps for doors and soft beds inside. On Saturday, Lucy paced on her chain, panting and wagging her tail, inspecting their work, nudging hands for pats and rolling over for belly rubs. Taz lay under a truck, watching from afar. Their owner wasn't home for the fence-building. The dogs also will have the company of a rooster, who has been known to escape his pen by Lucy's tree and bunk down with her in her dog house, the owner told Willison. Volunteers brushed out Taz's shaggy gray-and-black coat, gave both dogs a bath, buckled on fresh collars and took the pups for a walk on a leash. Then came the dogs' moment of freedom. Unleashed, Lucy and Taz bounded around their separate spaces, exploring. Tails wagging, they sniffed each other through the fence. Taz crawled into his new kennel, then came back out and rolled on the grass. Someone threw him a squeaky ball and the old dog tossed it in the air and chomped it in delight, agile as a puppy. Lucy, exhausted from her busy day, finally sprawled in the shade. "Look at those happy dogs," said volunteer Renee Canfield of Kelso. "Now I'm gonna cry." After more than five hours of work, Fields put down her hammer, but she's not finished with these dogs. She'll continue checking on them regularly as part of the Friends for Fido program. She'll pick up poop in the yard, and she hopes the owner eventually will allow her to take Lucy and Taz on walks. Fields also is trying to get a Southwest Washington chapter started for Fences for Fido so the Portland volunteers don't have to come so far north. "There's a million dogs here that need it," Fields said. • Dogs are pack animals who want and need socialization and companionship. Do you love animals? If you do, can you swing a hammer? Ever wish you could help dogs that spend their lives on a chain?